Here in West Texas bugs are just a fact of life, but that doesn't mean I want them in my house! We have had a pretty annoying issue with roaches since since we moved into this house. We have tried about a million things to get rid of them with no real success. As you can imagine when these new Combat Roach Killing Bait Strips came out I was pretty excited to be selected to try them. They are not toxic to my children and pets like the sprays and bombs that can be used. They are easy to use to, which was pretty nice for a change. They came in a package of 10 which was great because then I could place them all over the house to make sure I got ever inch of the house covered. It was really simple to break them apart. Then all that needed to be done was removed the back and the front to expose the bait and stick it down and I was done! My hands never had to touch any chemicals and there was no smell put off. 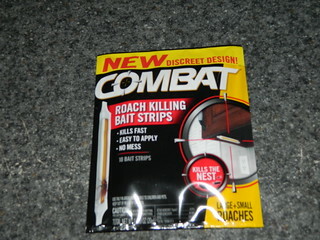 I have had the Combat Roach Killing Bait Strips down for about a week now and I have noticed a reduction in roaches. I can't wait as the weeks go on to see if the roaches are actually eliminated! At this point I am more then thrilled with the lowering of numbers because it is a step in the right direction! We also received the new Ant Killing Strips from Combat, but with Mother Nature having so many mood swings they have not yet been needed.lol Stay tuned this summer for further updates!